The growth in use of mobile devices and increasingly complex customer journeys means that multichannel retailers need to deliver customer experiences that that integrate across customer journeys as consumers increasingly use multiple channels on the path to purchase. Given the growing importance of omnichannel marketing, UX consultancy Practicology has teamed up with Google in a recent benchmark report, to review omnichannel experiences across Europe. Retailers are strongest in providing integration with store information, for example through store locators and also returns. Integrating personalization across channels performs has the lowest score with using in-store technology also scoring relatively low. Although this report focuses on retail, you can use our popular free multichannel marketing benchmark templates to review your performance across different digital marketing channels and customer experience. 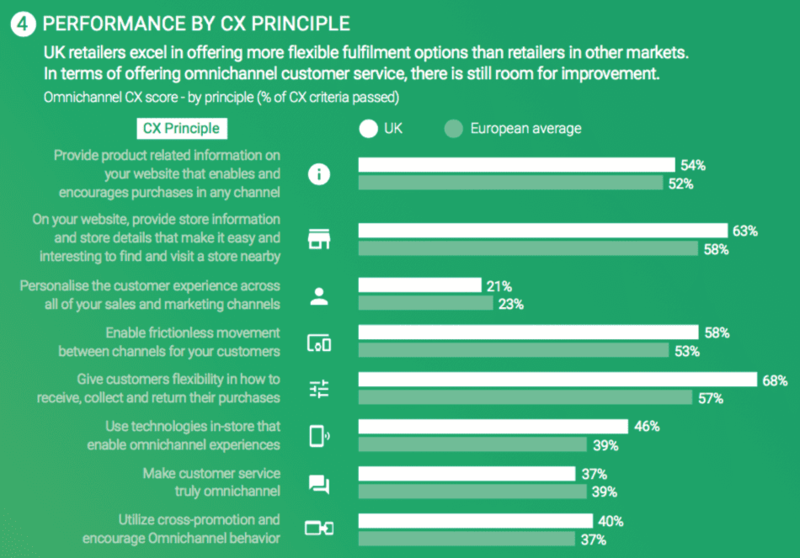 Sample: Google commissioned in-depth reviews of the omnichannel customer experience offered by 145 retailers in seven European countries to help businesses understand the best examples of seamless experiences across channels. Retailers were then benchmarked and ranked.